In the modern world, however, we have technologies that allow people to satisfy their craving for social contact without all the costs. Going on Facebookor other social media, you can have controlled interactions with a large number of people and quickly generate lots of virtual pats on the back (in the form of likes and smiley faces). And you can edit what you say in advance to reduce the odds of making a fool of yourself (not everyone takes advantage of the editing option, of course, but it is there). To accomplish all this virtual social contact, you don’t even have to leave the house, thus saving calories and time, and reducing the risk of catching a disease from other people. 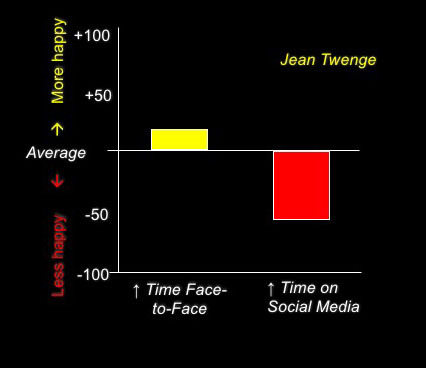 Social psychologist Jean Twenge presents data suggesting that the answer is “probably not.” In fact, Twenge has data indicating that use of social media may be bad for young people’s mental health. Young people who spend relatively more time on social media are more depressed and anxious than those who spend relatively less time on social media. On the other hand, young people who spend relatively more time in face-to-face contact with actual friend are relatively less depressed and anxious than average (see Figure 1). This is troubling because, as Twenge reports, between the years 2000 and 2015, since the introduction of iPads and iPhones, 40% fewer teenagers are getting together with their friends every day. You can think of social media as analogous to Ben and Jerry’s ice cream. Our ancestors craved fats and sugars, but found it difficult to locate good sources of nutritious food. Hence, our brains’ reward systems light up like a slot machine in Las Vegas whenever we get a taste of triple fudge ice cream, which contains more nutrients than most of our ancestors could have found in a week. But in the modern world, at least the first world, where you can stock your fridge with rich sweet fatty foods, and you’re not likely to starve, you would live a longer and healthier life if your brain lit up every time you ate a bowl of collard greens. Ben and Jerry’s, as wonderfully delicious as it is, is parasitizing a formerly useful ancestral motivation. This is what evolutionary theorists call a “mismatch” between an ancestral mechanism and the modern environment. Social media are like Ben and Jerry’s for our brain’s social modules – our brains light up on receiving quick access to gossip, jokes, and “likes” from dozens of friends all at once for minimal effort. But like too much ice cream, too much social media doesn’t seem to be good for you, even if your brain thinks it feels good. Like Ben & Jerry’s ice cream, social media earns tremendous profits by parasitizing evolved mental mechanisms that were good for our ancestors, but mismatched to the modern world.